By the time home buyers make it to the closing, it’s smooth sailing, right? Wrong. For home buyers, the adage “loose lips sink ships” is pretty darn spot-on as a best strategy at settlement. In fact, “there are things that home buyers could say that could stop the closing entirely,” warns Jennifer Baxter, associate broker at RE/MAX Regency in Suwanee, GA. Moreover, if settlement gets delayed on your account, there can be major repercussions. “If you don’t close on time and it’s your fault, you could be considered in default,” which means you’ve failed to meet your obligations to the sales contract, says Washington, DC–based real estate agent Katie Wethman. Another financial consequence? 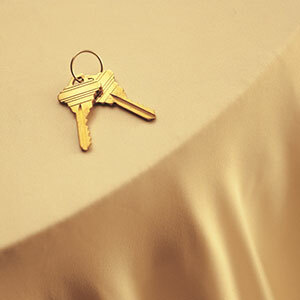 Your mortgage commitment has an expiration date, as does the lock on your interest rate. And with interest rates ticking up, “even if you’ve delayed closing one day, it could raise your interest rate if your lock is up,” says Baxter. The bottom line: You might just lose the house altogether. “In a really hot seller’s market, the person could decide to go with another home buyer if you can’t close on time,” says Wethman. Clearly, there’s a lot at stake. You certainly don’t want to say something at closing that could keep the deal from going through. But you also don’t want to say something that could hurt the seller’s feelings, since who knows if you might need his help in the future. So to raise the odds that all goes smoothly, here are five things you should never, ever say at closing. Before a mortgage lender approves your loan, the company’s underwriter will do a final review to verify that your employment status hasn’t changed since you were pre-approved for the mortgage. That usually takes place a couple of days before closing, so if you just quit, your lender might be caught by surprise. Surprise is not good. In fact, you might need to sign a document at closing confirming that your employment status has not changed. Before approving the loan, your mortgage lender will also check to make sure your credit score remains unchanged before closing. If your score haschanged, the company might raise your loan’s interest rate, says Judy Weiniger, broker associate and CEO at Weiniger Group in Warren, NJ. So what does this have to do with furniture? Using a credit card to buy furniture – or getting a loan to buy a car—could negatively affect your credit score. And, sadly, credit-damaging behavior is a common mistake. A recent TransUnion study found that consumers increase their credit card spending as much as two or three times their previous rate just before they close on a home. The lesson? At closing, it’s best to avoid talking about anything that could have potentially affected your credit score lest your lender uses this info against you. A home appraisal, you might recall, is where a lender assesses how much the home is worth. This price might be different from what you’re paying for the place. If the appraised value is higher, that means you got a bargain. Congrats! Go ahead and high-five yourself all you want; however, don’t share this news with the home seller since it means he clearly “didn’t” luck out in this transaction, and sold his home for less than what it might really be worth. As the home buyer, you aren’t required to share with the seller what the home appraised for. Thus, Baxter advises home buyers to keep that information private. “If you’re getting a great deal, there’s no need to rub it in the seller’s face,” Baxter says. Closing is neither the time nor place to make last-minute requests of the seller. The exception would be if there’s an issue related to home inspection repairs that you found during the final walk-through, in which case you should absolutely speak up, says Weiniger. However, if you failed to make your offer contingent on something, it’s your responsibility to take care of it—not the seller’s.